The bloody coup in Kiev in 2014 and the subsequent joining [reunification] of The Crimea to Russia is already becoming history. Currently nobody investigates the true reasons and main characters of this unprecedented US intervention in the affairs of Ukraine and Russia, which has changed the centuries-old character of relations between the two fraternal peoples. This was done in an absolutely cynical way and the guilty party was upheld [by the West] as Russia. Now Russia is presented as an aggressor capturing foreign territories for the whole world. That’s how they rewrite history and twist basic democratic values right in front of your eyes. I was very happy to find on “Global Research” two articles by Eric Zuesse “Obama’s Double-Standard on Russia: He Attacks Russia, then Condemns Putin for Defending Russia from His Attack“, Global Research, March, 19, 2015 and “Sweden Joins NATO’s Emerging War Against Russia“, Global Research, July 05, 2016 containing the analysis of events in Kiev in 2013-2014, their causes and the true instigator. Without dwelling on the historical justice of the reunification of the Crimea and Russia, I would like to say that this step of Vladimir Putin was effective in preventing bloodshed in The Crimea. Residing in the village of Partenit on the southern coast of the Crimea since November 2013 and often visiting Simferopol, the capital of the Republic of Crimea, and other cities, I witnessed escalation of tensions on the peninsula at the beginning of the events on the “Maidan”. This became especially noticeable starting from the end of December – the middle of January 2014, when the events on the “Maidan” began to turn into bloody massacres. The attitude of the Ukrainian leadership towards those events was explained by the fact that the Rada went on New Year’s holidays. What is this – criminal negligence or treason? At that time, various nationalists became active, claiming their rights to The Crimea. As events heated up in Kiev, local separatists became active. The events happened simultaneously so that it was obvious that they had the same “customer” [sponsor]. Eric Zuesse  described not only the sponsors, but also specific individuals being responsible for those actions. Just after the coup, the new government in Kiev decided that the Russian language is no longer an official language. Thus, it provoked the continuation of bloody actions in the Crimea, where almost everybody speaks Russian. The movement of armed young men from the “Maidan” to the border of the Crimea was accompanied by sharp activation of local nationalists. Something terrible was brewing. The tension in society reached its peak. And at this moment, Russian military men appear in the Crimea, called “polite people” by the Crimeans for the fact that their appearance and actions are absolutely imperceptible and peaceful. I saw several “polite people” in Simferopol near the Government building; sometimes I met cars with soldiers on the roads. No acts of violence or shooting have been seen or heard anywhere. The appearance of “polite people” immediately calmed tension in society, arose sincere relief and joy in the people. 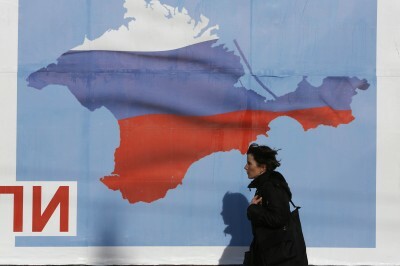 In the referendum, the overwhelming majority voted for joining the Crimea to Russia. “Obama is the aggressor here, just as Hitler was the aggressor in Poland in 1939. And O’Bomba blames Russia as the aggressor, just as Hitler blamed Poland”. Summing up, we can say that Obama’s operation cost Ukraine and Russia death and destruction and suffering of millions of people. The political and military confrontation has intensified in the world. Truly. I hope that Global Research will continue to publish the truth about the situation in the Crimea and the true instigators of the coup in 2014 in Kiev. This will make it impossible to rewrite history, kindle hatred between nations, push the world toward a third world war. Articles by: Tsygankov S. S.